Many nations honor their veterans on November 11, including our own. This is a great way for people to thank those who gave so much, some of them their very lives, to protect the rest of us. While this is a worthy endeavor that as a veteran I truly appreciate, we are missing recognition of another important group. Almost every military member has family waiting for them back home. Parents, spouses or “significant others”, maybe children, maybe siblings. Someone watching the news, hoping they never hear their loved one’s name mentioned. Within this segment of folks is the Blue Star Mothers. The Blue Star Mothers began as an idea by Captain George H. Maines. He placed an ad in the Flint News Advertiser on January 22, 1942, asking mothers of veterans to fill out a coupon and send it back into the paper. 300 mothers attended the first meeting at the Durant Hotel in Flint, Michigan. The organization quickly grew to over 1000 members and a permanent organization was formed. WWI Army Captain Robert L. Queisser . 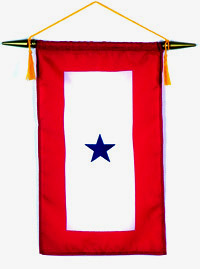 designed the Blue Star Banner that the group takes its name from to honor his two sons serving on the front lines. It swept the country and became the unofficial symbol of a family with a child serving in the military. President Woodrow Wilson added to the history of this banner by approving a suggestion made by the Women’s Committee of the Council of National Defenses that mothers who had lost a child serving in the war wear a gold star on the traditional black mourning arm band. This led to the tradition of covering the blue star with a gold star on the Service flag to indicate that the service member has died. This led to the formation of another group, The Gold Star Mothers Club. Our nation has seen many lives lost in combat since Armistice Day, which we now call Veterans Day, was created. More than 668,000 service members have been killed in the years following, each one leaving behind a mother who would never see their child again. Some had to bear the burden of losing more than one child to war, the most famous being Aletta Sullivan, who lost all five of her sons at the same time on the USS Juneau (CL-52). Regardless of the number, each of these women has had their hopes dashed at one point in their lives, either through official correspondence from the military or personal visits by solemn service members. Whatever the manner that the information was conveyed, these women lost their babies before their time. Some take comfort in the fact their children were defending the nation; some never receive solace. The last Sunday in September is set aside to honor these women. Sadly, it does not get the recognition that Veterans Day is afforded. Some say that dying for your country is the ultimate sacrifice, but mothers have a harder job. They must watch their babies go off, and pray every night that those babies come home. And then some don’t. I hold my brothers and sisters in arms in the highest regard, especially those who gave their lives. But I hold the mothers left behind in even higher regard, having helplessly lost their children in defense of our republic. So honor those who have protected and still protect us. Just make sure you take a moment to say a prayer for those that bore and raised those brave warriors. How did Syria become our responsibility? Great post Shane, thanks for sharing. I did not know about this organization.